There has been a church on, or very close to, this site since the 11th century, although no exact date can yet be established. When London Bridge opened, in 1209, the church of St Magnus the Martyr was stood at the northern end of the bridge, so those venturing into the city, from Southwark, passed by the west doors of the church. In 1633 the church escaped being destroyed by fire, when the whole of London Bridge went up in flames. Fortunately, there were vacant areas, at either end of the bridge, which prevented the fire from spreading to the mainland. However, the church wasn't so lucky when the Great Fire of 1666 began, as it was one of the first buildings destroyed by the conflagration. Work on rebuilding the church began in 1668, under the supervision of master mason George Dowdeswell. The church was largely completed by 1676, although its completion would take until 1687. A steeple, which many call one of Wren's finest, was installed between 1703 and 1706. St. Magnus would prove to be one of the most expensive of Wren's churches built, after the Great Fire. Yet again, in 1760, the church was caught up in another fire. This one destroyed much of the roof and damaged the outer fabric of the building. With London Bridge going under improvements, which saw the introduction of pedestrian walkways, the church had to lose its vestry rooms and open up the side arches of the tower, so that pedestrians could pass beneath, on their way to the city. In 1782 the northern window was blocked up, in a bid to keep out the unwanted noise from the nearby billingsgate Fish Market. 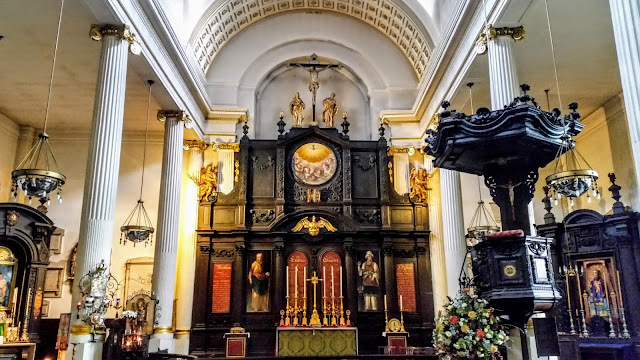 Following a thorough reparation, in 1825, the church was returned to its former glory as it had been under Sir Christopher Wren's construction. The east window, which had been blocked up, was also restored. The organ was also repaired and re-installed ready for the reopening of the church, in 1826. Churchgoers held their breath again, in 1827, when warehouses to the east of the church were consumed by fire. If it hadn't been for the firemen who fought to control the blaze, St. Magnus may have been lost forever. Another fire, in 1849, almost claimed the church, too. The interior of the church went through a thorough restoration, in 1924. In 1987 David Aggett crafted a model of London Bridge, as it would have appeared in the 1400s, which was then gifted to the church by the Worshipful Company of Plumbers.